The Chandigarh (I) commissionerate of central excise department has detected evasion of central excise duty worth Rs 22.19 crore, involving alleged misuse of central value added tax (CENVAT) credit by Philips Electronics India Ltd, Chandigarh. Chandigarh municipal corporation in the past more than three years. Hundreds of applicants for Aerocity are finding themselves in a fix. Caught between outstation realtors and local real estate agents, several applicants are unable to encash their jackpots due to misleading and contradictory selling and buying rates being quoted by the two sections. The Punjab and Haryana High Court has come to the rescue of the occupants of a Sector 17 building whose premises were sealed by the UT Estate Office using its “arbitrary power to seal any portion”. 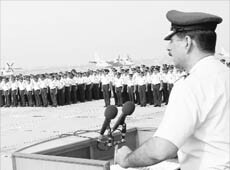 There were bureaucrats and police officers; teachers and businesswomen; writers and singers, social workers and educationists, blood donors and artistes— all 21 of them. At a function on Friday contribution of each one of them was acknowledged as they were conferred with ‘Great Woman’ award. Meaningful participation of young people within the society plays an important role in enhancing the basic infrastructure of a nation. This was stated by Deputy Secretary General of Commonwealth Secretariat Mmasekgoa Masire Mwamba, while addressing the delegates during a seminar on “Dialogue and Mutual Understanding” to commemorate the International Year of Youth (August 2010-2011) at Commonwealth Youth Programme Centre at PEC campus here today. Strange are the ways of the UT administration. On one hand though a sizeable population in the city is living amid inhabitable conditions in slums, on the other small flats constructed under the ambitious slum rehabilitation scheme have not been handed over. This state of affairs conveys a picture of sheer negligence. 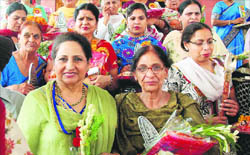 Blame it on administrative rigmarole or the lopsided policies of those at the helm of affairs, but the fact is although the flats in Ram Darbar meant for ‘economically weaker sections’ of society have been ready for many months now officials have still not handed over possession to the eligible allottees. 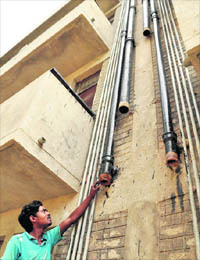 Criticising the recent move of the Chandigarh Housing Board (CHB) warning the residents of CHB flats against violations, the Chandigarh Residents’ Social Welfare Federation in its executive committee meeting held recently, alleged that it is clear indication of a pick-and-choose policy. In an attempt to check the selling of tobacco products in the city, the Chandigarh administration has framed the draft of Chandigarh Licensing of Tobacco Trade Rules, 2010, for granting licence. The rules are expected to be notified soon. Chandigarh, October 8 Kar Sahayta, a single window help desk for providing information to taxpayers, was launched by the Central Excise and Service Tax Commissionerate, Chandigarh (I), here today. 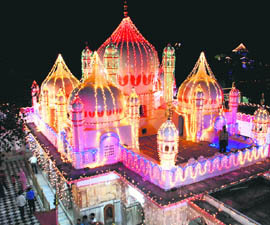 About 35,000 devotees converged on the Mata Mansa Devi Shrine on the first day of the Ashwin Navratras to pay obeisance to Goddess Mansa, one of the incarnations of Goddess Durga, here today. The beat of dhol filled the air and devotees sang bhajans in praise of the goddess even as serpentine queues grew longer with every hour. Carrying parshad, the queue moved ahead at a painfully slow pace though the dholis kept the crowds entertained. Thousands of people, including heads of various religious sects from across Punjab, would converge at Chappar Chidi village tomorrow to commemorate the Fateh Divas of the historic battle that saw Baba Banda Singh Bahadur and his brave soldiers win over the Mughals at Chappar Chidi almost 300 years ago. While five aircrafts, including two An-32s, two Dorniers and an Avro, took off from the city airbase to form a spectrum formation flying display during the Air Force Day Parade at Hindon to mark on the 78th Air Force Day, IAF units in Chandigarh paid rich tributes to martyrs today. Yet another genre of folk theatre spectacle of Maharashtra “Tamasha” and folk dance form “Lavani” came alive in the ongoing “Festival of Theatre Traditions” at the Randhawa auditorium here today. The Mask Theatre in association with North Zone Cultural Centre staged two socially relevant plays at the Kalagram complex here today. 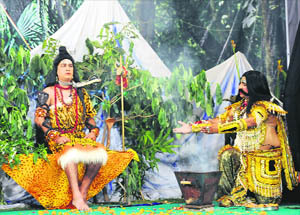 Mask Theatre team evolved the script and form of both plays and Ravinder Ravi directed the plays. In a bid to control vehicular traffic on the campus, Panjab University will soon earmark different parking sites for outsiders and also levy parking fee. Panjab University Vice-Chancellor RC Sobti has been invited to deliver speech as a distinguished guest on the opening ceremony of the East Asia Higher Education Cooperation Forum Summit to be held at Kunming in China from October 13 to 15. Emphasising on the need to provide a skill-based education system rather than degree-based system to solve the problem of educated unemployed, Dr SS Mantha, chairman, AICTE, delivered a lecture during a seminar on “Education reforms: Role of regulatory bodies” organised by PHD Chamber at PHD House. The centre for advanced study in geography, Panjab University, has invited candidates to join basic courses in remote sensing, GIS and GPS through distance learning. Krishna Mohan, chairperson of the geography department of the university, said the fifth course in the series would start from this month. RK Singla, an RTI activist, has again alleged Panjab University (PU) of denying information. Singla claims that attempt was made by PU to conceal information about a case of the University Business School, where he claims that paper setting for a particular subject “Strategic management” code No 601 initially set up for November 2004 exam was used for November 2005 exam. Shashikant and Adithi Gour of Mechanical Engineering and CSE, respectively, were selected as Mr and Miss Fresher, during the fresher’s party organised at Panchkula Engineering College, Mouli, near Barwala today. 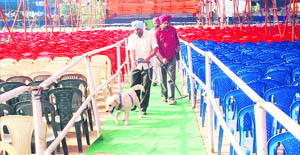 The local administration had made adequate arrangements on the first day of Navratra mela which began today. Informing this, Naresh Kumar, tehsildar, Kalka, told The Tribune that keeping in view the convenience of the devotees, special arrangements have been made by the administration on every aspect. The Judicial Magistrate, First Class, Ambala, here today sentenced a former deputy sarpanch of Tepla village to six months’ rigorous imprisonment and a fine of Rs 500 for misappropriating panchayat fund. Taking suo motu cognisance of a news report on eco-friendly auto-rickshaws, the Punjab and Haryana High Court today issued notice of motion to the states of to Punjab, Haryana and Chandigarh. 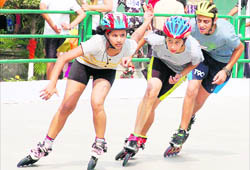 Skaters from Delhi hogged the limelight, as they won most of the quad and inline races on the first day of the CBSE North Zone-I Roller Skating Championship, which started at KB DAV School, Sector 7, here today. Chaman Lal DAV School, Sector 11, defeated St Xavier’s ‘B’, Sector 20, by 110 runs in the 2nd Clive Shear Six-A-Side Cricket Tournament being organised by St Xavier’s School at the Tau Devi Lal Sports Complex in Sector 3 here today. 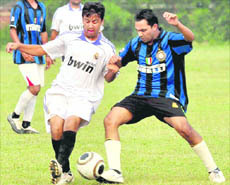 The Friend’s Football Club is set to clash with the NPS Club, while the Star Club would clash with the Rajeshwar Football Club in the semifinals of the ongoing 5th Kanwar Harbans Lal Memorial Football Championship being organised by the Youngsters Football Club. Guru Nanak Khalsa School, Sector 30, thrashed KC Public School, Jammu, by 26-3 in the CBSE North Zone 1st Handball Tournament being held at PML SD Public School, Sector 32, here today. Chandigarh Cricket Academy (CCA) piled up 642 runs against Rest of Punjab team at the end of the second day of the Punjab State Senior Inter-District tournament being held at the PCA Stadium here today.